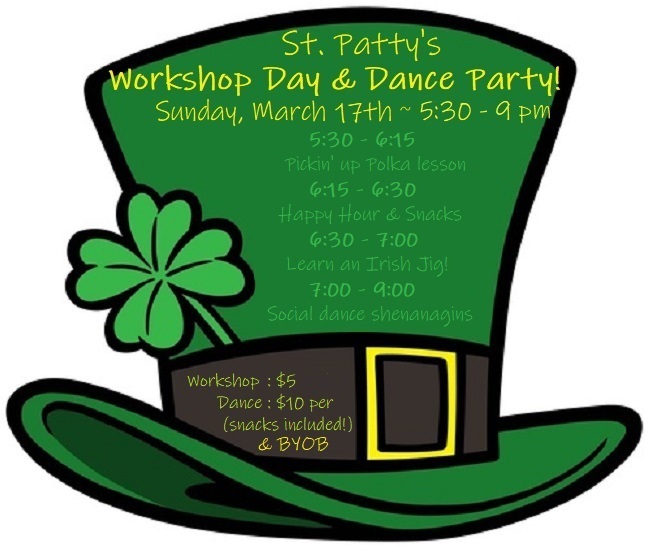 Join us for St. Patrick’s day dance shenanigans! We’ll learn to POLKA(!) – we’ll even learn a lil’ Irish jig! This evening begins with a polka lesson at 5:30 pm ($5). We’ll have some mingle time and snacks – and take a festive shot together (alcoholic & non-alcoholic options) – then take your shot at an Irish jig! Whoo-hoo! Following that silly scene – we’ll open the floor and dance the evening away! We’ll play a social dance mix – including country, swing, ballroom, etc. Simply a night of fun! All are invited…do share, and invite your friends! ← What do you think of our new website? !